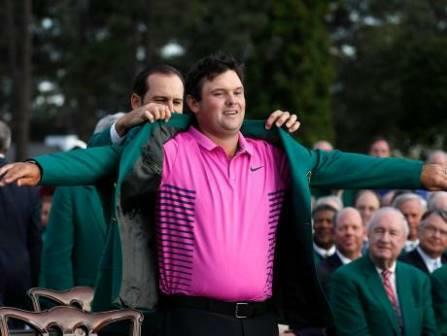 Augusta: Patrick Reed held off epic final-round Masters charges by compatriots Jordan Spieth and Rickie Fowler to capture his first major title, firing a one-under par 71 Sunday for a one-stroke victory. The 27-year-old US Ryder Cup firebrand out-duelled three-time major champion Spieth and Fowler, who birdied six of the last 11 holes, in an emotional back-nine drama that sparked roars and thrills at Augusta National. Reed, who had never cracked 70 in 12 Masters rounds until this week, became the fourth straight first-time Masters winner and the ninth first-time major winner in the past 10 such events, the only exception Spieth’s British Open win last year. “It’s almost impossible to put into words,” Reed said. In addition to the iconic winner’s green jacket, Reed won $1.98 million from an $11 million purse. Reed, whose breakthrough came in his 17th major start, finished on 15-under 273 with Fowler second on 274 after a closing 67 and Spieth third on 275 after matching the low final round in Masters history with an eight-under 64. Fowler sank a 7-foot birdie putt on 18 to pull within one and keep Reed under pressure to the 72nd hole. Needing a two-putt par from 25 feet at 18 to win the title, Reed ran his first putt four feet past the cup then sank the comeback effort and pumped his fist in celebration. Reed fended off last-pair partner Rory McIlroy on the front nine until the Northern Ireland star faded to a 74, sharing fifth on 279 with his dream of a Masters win for a career Grand Slam foiled again. Reed’s approach at the par-5 13th clung to a bank above Rae’s Creek, his title bid nestled with it, but he escaped with par to stay deadlocked with Spieth for the lead at 14-under. Reed sank an eight-foot birdie putt at the par-4 14th to regain a one-stroke lead. Spieth clipped a tree branch off the 18th tee and needed three to reach the green, where he missed an 8-foot par putt to match the 18-hole course record and settled for closing with his lone bogey. Spieth became only the seventh player to shoot 64 in the last round of the Masters, the first since Bo Van Pelt in 2012. On the front nine, Reed answered two bogeys with two birdies on the front nine to make the turn where he began at 14-under while Spieth started his charge with a 5-under 31 on the front nine, closing with his longest birdie putt from 12 feet. Spieth surged on the back nine starting with a 27-foot birdie putt at the par-3 12th, the same hole where he endured a quadruple-bogey 7 meltdown in 2016 that cost him the lead and his back-to-back Masters bid. A tap-in birdie at 13 was followed by a six-foot birdie at 15 and a 33-foot stunner at the par-3 16th to spark a tremendous roar. American Charley Hoffman aced the par-3 16th with a 6-iron, the 20th time the hole has surrendered a hole-in-one. And his playing partner, compatriot Tony Finau, birdied six consecutive holes from the 12th to 17th but missed a 10-footer at 18 that would have tied the Masters record birdie streak. World number one Dustin Johnson fired a 69 to share 10th on 281 and retain his rankings lead. Spieth, Rahm or Justin Thomas could have overtaken him by winning, Thomas firing a 73 to finish on 284 and foil his chance. England’s Paul Casey flirted with a course record 63 before closing with back-to-back bogeys in a 65. Webb Simpson, the 2012 US Open winner, made back-to-back eagles at the seventh and par-5 eighth. Tiger Woods, playing his first major event since 2015 in a comeback from nagging back pain and spinal fusion surgery, fired a 69, his week’s low round. The 14-time major champion sank a 29-foot eagle putt at the par-5 15th and birdied 17 but a closing bogey denied his goal of level par overall. Woods, a four-time Masters champion, failed to deliver on promise showed in two top-5 tuneup finishes but said he was glad to be back.